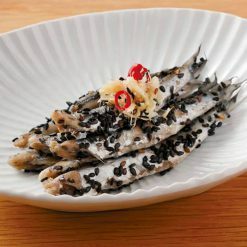 This unique item features anchovies that have been thoroughly pickled with sesame and black vinegar. Simply defrost and enjoy. Can also be used in sushi. Made with fresh Japanese anchovies caught in Kujukuri. The anchovies have their heads removed and are pickled in vinegar overnight (about 12 hours), softening them soft to the bone so that they can be eaten whole. Brown rice black vinegar is added to give the anchovies a mild sourness. These anchovies contain plenty of linoleic acid and oleic acid, both of which are beneficial to eat. Depending on the season, you may see similar products to this one being sold around Kujukuri. However, these products are refrigerated and the fish often vary in size. They do not use ginger or chili pepper as much, and they use ingredients such as chemical seasonings as additives. Take out the number of anchovies you need from the package and defrost them in the refrigerator. Once defrosted, they can be eaten as they are.The bellies of the anchovies have been opened and their backbones removed, which also allows them to be used for sushi. This product contains japanese anchovies (Chiba Prefecture), brewed vinegar, sesame, ginger, chili pepper, refined sake, sugar, table salt.. 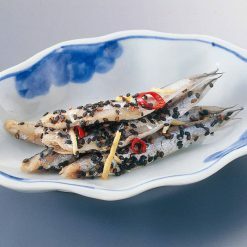 Origin of ingredients: anchovies (domestic). Prepared and packaged in Japan.